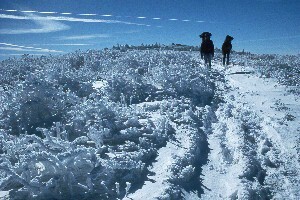 "High, wild, and snowy" has been the motto of the Harvey Broome Group since we started our annual winter backpacking trips in the late 1970's. The southeastern United States are not noted for their extreme winters. In fact, winters in the valleys are typically pretty mild, and with El Nino working to keep things almost toasty throughout this past "winter," the only solution for finding a wintry backpacking experience was to get high. And we don't mean by smoking dope. In many ways, one of the real joys of the southeast is that you can conduct your day to day living in a nearly snow free environment, and if you want to crawl around in frozen precipitation, you just need to head for the mountains. So that's what 19 members of the Harvey Broome Group found themselves doing the last weekend in January. 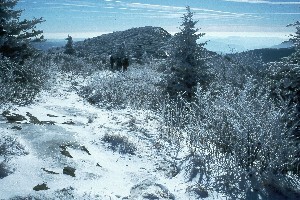 Our target was the magnificent Roan Highlands area; in particular, Grassy Ridge Bald. Topping 6100', Grassy Ridge rises from the Appalachian spine immediately south of the TN/NC border, southeast of Elizabethton, TN. In June, it is covered with a profusion of blooming pink-purple Catawba Rhododendron. In January, it is a different kind of world. When it is raining in the valleys, you can count on some white stuff up there. With the exception of Roan High Knob a couple of miles to the west, there is nothing as high for miles and miles to act as a wind break. The absence of trees of any size along its crest alludes to its inhospitable environment. Our group of hearty (fool-hardy??) 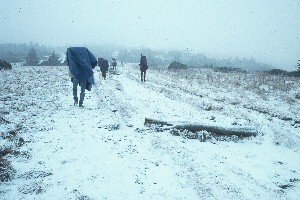 winter backpackers left the trail head at Carver's Gap late morning on Saturday, January 24. The forecast had been for very scattered light showers in the valleys, breaking up in the late afternoon. Well, it "showered" on us all the way from Knoxville to Elizabethton. As we had climbed up the side of the mountain on one of the few trans-mountain roads in the area (we don't like to see very many), fishtailing through the snow that covered the highway, and going off the un-guard railed side seemed like an increasing possibility. Because of the fir trees that surround the parking area at the trail head, it was hard to detect the wind that would soon hit us as we started the climb out of Carver's Gap. Carrying a lot of gear (extra clothes, food, and your biggest, toughest tent) and having to do it over steep, snow covered rocky trails, while you are wearing wind and cold gear can slow an otherwise snappy pace to a real trudge. Fog. Did I mention the fog? One of the other climatological aspects of hiking in the Roan Highlands is that due to their high elevations, the mountains are often shrouded in low lying clouds. On a clear day, you can see forever. On a typical day, you are lucky if you can see 50 yds ahead. This day was pretty typical. On a summer hike, losing people in the dense fog can be slightly humorous. Under winter conditions, with both temperatures and wind velocities in the mid-20's, it can be life threatening. Everyone was encouraged to stay in sight of the person ahead and in front of them, especially as they crossed the balds which intervene between the trail head, and the split which leads to the summit of Grassy ridge. On a clear summer day, the traditional spot for a late lunch is an appealing interlude, from which you can drink in the sweeping views. On this day, the only sweeping that was being done was of some of the hikers, as the wind gusts would threaten them with a loss of footing. "Lunch" consisted of us all huddling in a mass, munching M&M's, waiting for the last hikers to come in, like a heard of buffalo on some frozen western plain. Winter backpacking can be a taxing experience for your equipment, and I am referring to both that which one carries on one's back and what you carry between your ears. The challenging weather can really be a test of how well your equipment works, and can bring out both the best and worst in people. Just assembling your tent in wind and snow can be exciting. If you leave your gloves on, every task takes about four times as long to complete. If you take them off to gain dexterity, the pain of freezing fingers can be really distracting. We opted for the slow approach. The campsite is a small saddle which runs NE/SW across a narrow spot in the ridge. It is blessed with a good spring that runs well on even the coldest days. The wall of rocks on its northern side can act as great wind block for northwest gusts. We figured we had it made, until just after our tent was erected, and the wind shifted to the NE. In this situation, the saddle is known as the "wind tunnel," funneling all of the wind into the tents head on. Fortunately, I had been lucky enough to have pitched the tent with the sloped vestibule facing NE, which would act to shed the wind. I forgot about the snow blowing underneath the vestibule and filling up the entrance. After munching on their belated lunch in their tents, most folks opted for crawling out of their shelters and stumbling around in the wind and fog, hoping that the latter would lift for a view. It did not. Susie and I remained in our "hunkered down" mode, munching on snacks and reading our novels, brought along for just such an occasion. When it was time for dinner, we swept out the snow that had blown into the vestibule, fired up our trusty, although fuel-hoggish Coleman Apex II and started of meal of Cajun rice and beans and ham. About this time, over the wind, we heard two of our compatriots saying that they were leaving. They had hiked in with us, experienced the requisite fun of setting up their tent in the wind, taken a nap, cooked some soup, and having experienced "it all," were ready to head out, back to the cars, and find a party going on somewhere on a Saturday night. (I worried a bit about their safety, but when we got back to the trail head the next day, their car was gone, so they must have made it out.) Susie and I then experimented with a new dessert recipe that she had seen in Backpacker magazine: a easy, quick fruit cobbler, which turned out to be pretty good. After dinner, the snowfall rate increased, and a step outside the tent revealed many folks were inside with candle or other lanterns, spending the evening with diversionary activities. Susie and I had brought in our small white gas backpacking lantern. It can add some heat and light to what otherwise would be a cold, dark evening. I must have plowed through 100 pages of my book. Susie fretted about dying of carbon monoxide poisoning from the lantern vapors, but I pointed out that the wind outside was forcing a lot of air through the tent, and that I was unlikely to be attending any funerals for her in the near future. We zipped our sleeping bags together and turned out the lights about 9:30 pm. About 1 am, the fun really began. The winds picked up to maybe 40 mph, and the snow fall accelerated. Even the sturdiest of winter tents will shake under that sort of wind load, and ours pelted our exposed faces with frozen condensed breath falling off the tent walls. I burrowed down into my bag about as far as I could get, but I knew that I would have to get out soon to relieve my bursting bladder. Hey, is this fun, or what? Will Skelton's tent did not fare as well. Whether it was due to improper set up, or poor design, his tent poles seemed to be collapsing, and he had to get up in the middle of the wind storm, and move his tent to a more protected area. The wind slowed back down to about 20 mph around 3 am, and it was easier to sleep. The next thing I knew, it was getting light, and a quick peek outside revealed that the clouds were blowing off, and we were going to be treated to a beautiful morning. The sun sparkled, the vegetation was covered with hard packed snow, and we had survived the night. A look at the thermometer ( I had to dig it out of the wind blown snow) showed the temperature had fallen to 10 degrees. Not especially horrible, but enough to make you feel like it was winter. There was still a "refreshing breeze," but with the sun out, it seem like a whole new world. The views really were sweeping, and the snow-covered landscape was a photographer's paradise. Of course, it took longer to break camp: everyone seemed to be lingering to enjoy the scenery. The hike back to Carver's Gap required splitting one's attention between watching your feet and drinking in the views. It seemed to make the experience of the last 24 hours worth it. Even the wind seemed to be dying down a bit, and it was as though many of us were wishing we could spend another night amidst the winter splendor. Yeah, right.